Greece really knocked our socks off! We flew into Greece with high expectations as we had heard amazing things but it truly was more incredible than we could have imagined. This country is one of our favorites on the trip so far and we would highly recommend this vacation spot! Greece has it all- history, culture, beautiful scenery, land and sea activities and excellent food. Visiting the Acropolis in Athens was an incredible experience! We started our trip in Athens at an AirBnb near Monastiraki Square. We loved our area, walking the picturesque streets in the Plaka District, eating kebabs and gyros near Monastiraki Square and exploring the Acropolis. A highlight of our trip thus far was going to an night concert at the Odeon of Herodes Atticus outdoor theater. The concert featured over 100 guitars and our seats had a view of the Acropolis lit up at night with a full moon above it. This was the most incredible concert venue we will probably ever watch a performance in! If you ever take a trip to Athens, you NEED to look into going here if a performance in the Odeon of Herodes Atticus happens to overlap with your stay. 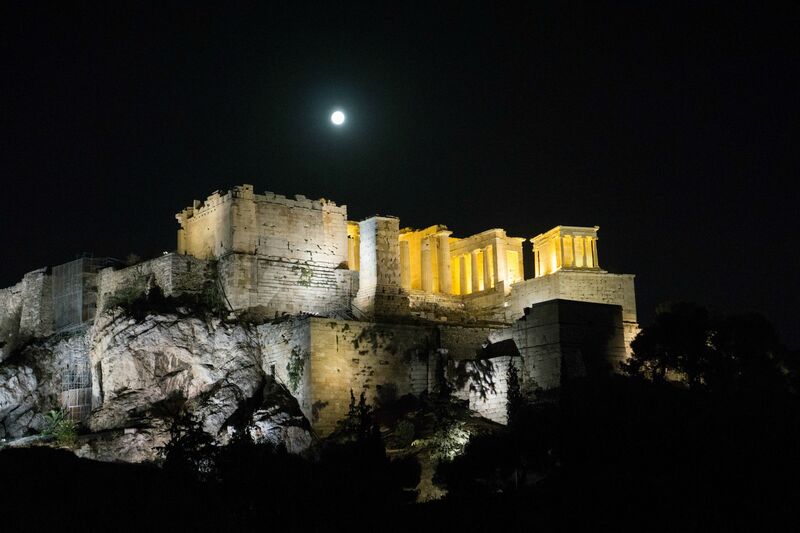 The Acropolis looks beautiful at night, especially under a full moon! After 3 nights in Athens we took the Blue Star Ferry to the Greek Isles. We chose the islands of Paros, Naxos and Santorini to have a variety of different island life to explore. We loved the island of Paros- it was a laid-back, beautiful place. We stayed in Parikia overlooking Aegean Sea and rented a scooter to go to the picturesque town of Naoussa and stunning Golden Beach. 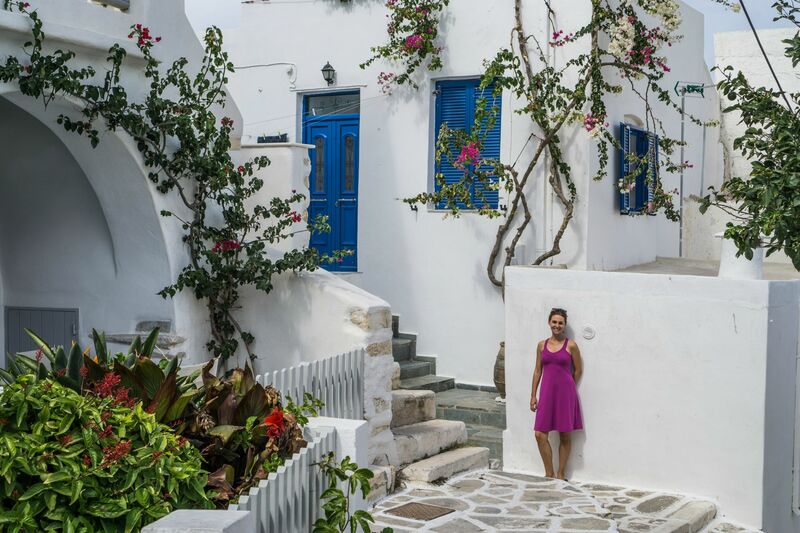 We loved wandering around the picturesque alleyways of Paros. 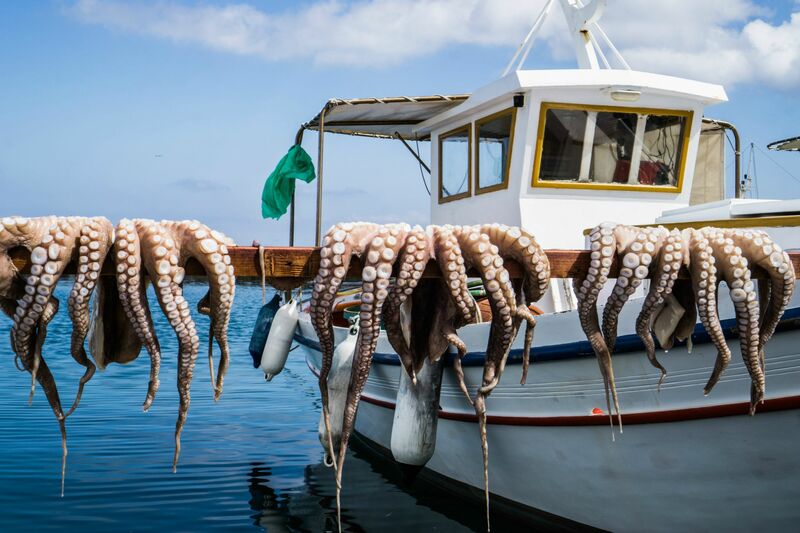 A common sight in the small fishermen seaports on the isle of Paros. Naxos was our next island which was a tad bigger than Paros. A highlight of our time in Naxos and our one year adventure was taking a scooter high up into the mountains and exploring the charming towns of Apiranthos, Halki, and Filoti while retreating to the beach of Agios Prokopios in the evenings where we watched the spectacular sunsets with mouth-watering gyros. 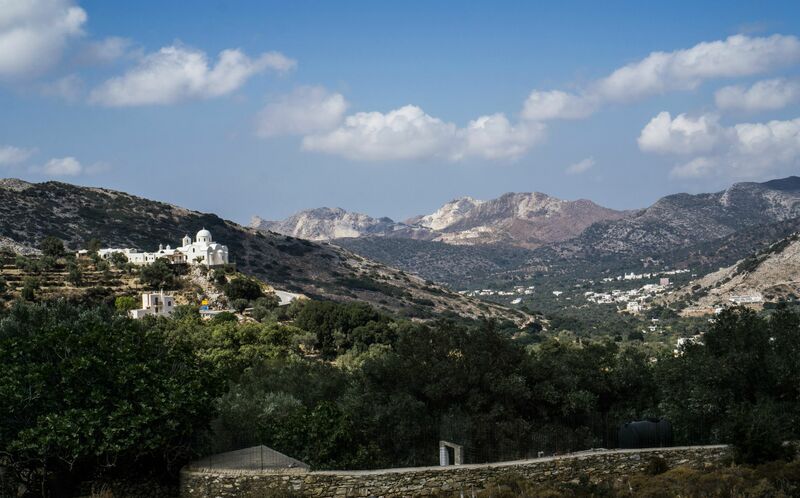 Spectacular views on our moped ride around the island of Naxos. Santorini was our final jaw-dropping stop on the Greek Isles. This island is very touristy but for good reason!!! Santorini is absolutely gorgeous with its whitewashed towns on the top of the volcanic caldera and breathtaking views. We managed to stick with our tight budget somehow while staying in posh Oia at Galini Oia accomodations. 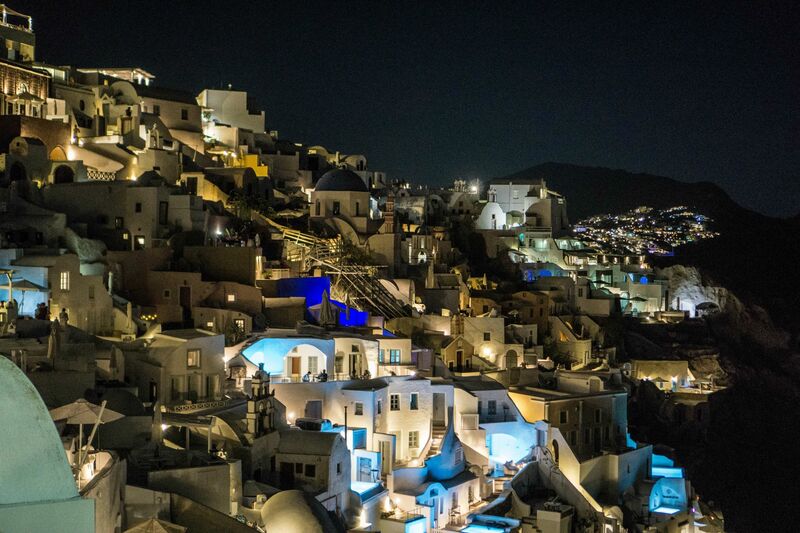 Oia really came alive at night with the glowing white buildings and luminescent blue pools hanging over the caldera. Highlights of our time in Santorini included taking the Caldera trail from Oia to Fira- we loved this hike so much we did it twice. Both times we stopped for breakfast at Zafora’s in Fira- this was hands down the best view of Fira and the ocean from the second floor level outdoor dining area. We loved that they weren’t busy in the mornings (most people dine for lunch or dinner there) so we felt as if we had the magnificent view to ourselves (which can be very rare on the very busy island of Santorini)! We also enjoyed walking down and up the many stairs (past the donkeys) below Oia to eat fresh seafood at Taverna Katina overlooking the red rock above Ammoudi Port. We definitely earned our dinner after taking all those stairs but the views and seafood were well worth the effort! 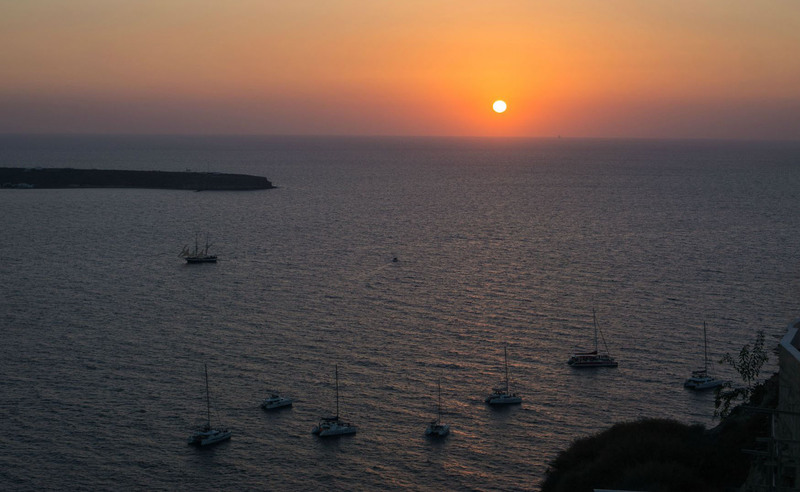 Stunning sunset views from the island of Santorini. 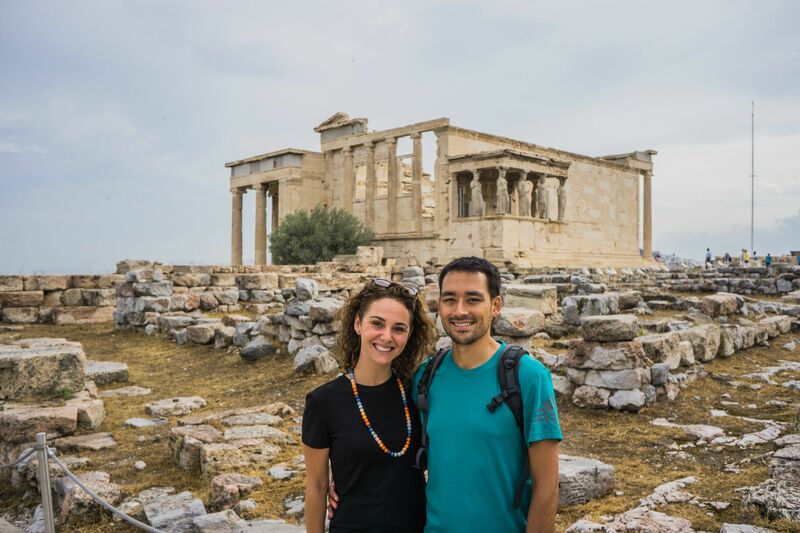 Overall, Greece is incredible and we would highly recommend this trip for all ages and travel types. There really is something for everyone here- history, ruins, mountains, ocean, great food & wine, picturesque villages and plenty water and land activities. If you get the chance, go there and you will not be disappointed!! Wandering around the island of Santorini at night provides views like this.